If you have ever set foot into the medical world, then you have probably been impacted by the work of a nurse. All across the country, nurses are the caretakers, advocates, teachers, and friends who make caring happen. For a long time, Mandy K. didn’t know what she wanted to do with her career. As a high school student, she applied to five different colleges, declaring a different major field of study on each application — and she just couldn’t decide! 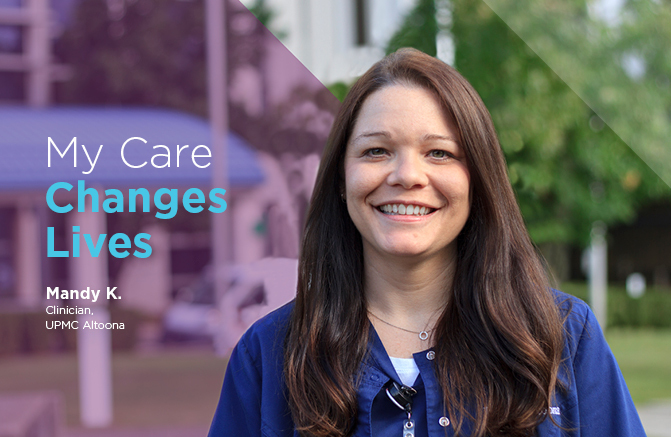 But now, a decade into her career, Mandy can’t imagine doing anything other than nursing, and she can’t imagine being a nurse anywhere other than UPMC Altoona. Mandy shared her passion for working at UPMC Altoona with us, and now we’re here to share the things about Altoona that Mandy loves most! Born and raised in Altoona, PA, Mandy left her hometown after high school graduation to go to nursing school in Pittsburgh. But after finishing an externship at UPMC Children’s Hospital of Pittsburgh, she returned home to serve the community that she loves with her newfound nursing skills. As a result, she’s been rewarded with a meaningful career and powerful connections with her neighbors and coworkers. Because UPMC Altoona is a small community hospital, Mandy and her coworkers are often called upon to fill multiple roles. Her work as a clinician in the Progressive Care Unit (PCU) allows her to care for a wide range of patients. In her unit, Mandy has cared for two-week-old babies, a 103-year-old, and every type of patient in between. I love the people that I work with, so that makes it a better day, every day. While Mandy loves caring for her patients, she has just as much passion for teaching and influencing the dedicated staff working alongside of her. Throughout the year, as nursing students and new employees come on board, Mandy draws on her years of nursing experience as a mentor and preceptor. For employees who are new to UPMC Altoona, Mandy’s guidance and training help them adjust to the “real life” side of medicine. According to Mandy, she particularly enjoys playing a formative role in the careers of new graduates, helping them learn to apply and practice what they learned in school. At the end of the day, Mandy has chosen to build her career at UPMC Altoona for one simple reason: “I love the people that I work with, so that makes it a better day, every day,” she says. After the 11 years that she has spent in the same unit, Mandy could have easily chosen to switch tracks or pursue a different area of medicine. However, her love for her coworkers, her community, and the people who surround her have kept her right where she wants to be – at UPMC Altoona.